Tucked away in a pocket of the Maya Mountains, Blancaneaux Lodge is a 20-room luxury resort where waterfalls tumble into natural pools above the jungle canopy. Need isolation? 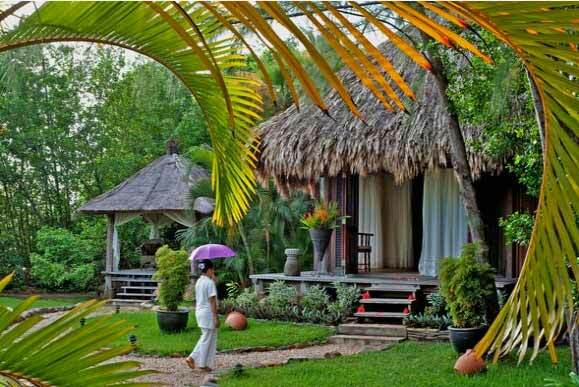 Coppola's Blancaneaux Lodge is in the middle of the untamed, natural beauty of a Belizean forest preserve. Need local culture? Turtle Inn is on the coast near the fishing village of Placencia. As Hummingbird Highway carves away from Belize's resort-laden sands, pavement dissolves into rutted dirt tracks and the dense jungle canopy starts to press in from all sides. The tallest buildings pushing through the foliage are Maya ruins, and howler monkeys and macaws lurk in the ceiba trees. Late at night, distant thunderstorms ring the horizon, broad sheets of lightning illuminating the mountains. Turtle Inn is a 25-room seafront hideaway that combines natural wonders with luxury style in individual thatched cottages. Before I brought my family to Belize for 10 days last summer, I packed a copy of "Heart of Darkness," knowing that although traveling through Central America wouldn't precisely parallel a trip up the Congo River, Joseph Conrad's novel would remind me that the book was the indirect inspiration for our itinerary. I had traveled to Belize several times before I started a family, and even though tourism has transformed much of the country for the worse in the intervening 20 years, I wanted to revisit what I loved most about the tiny but diverse nation: lavish lodgings smack in the middle of untamed, natural beauty. And because I cover the movie business for The Times, I thought of no better way to see the country than by staying at Francis Ford Coppola's two Belizean resorts, Blancaneaux Lodge and Turtle Inn. 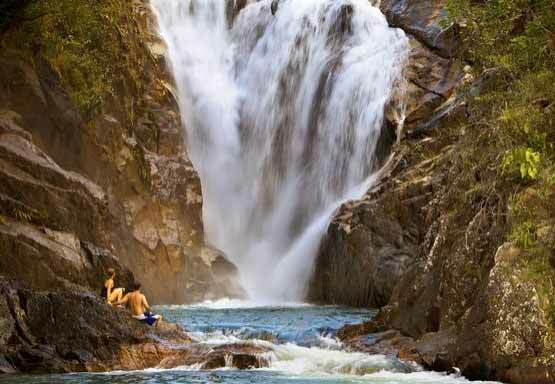 Big Rock Falls offers swimming, being washed over by the cascade of water and plenty of picnic sites. Not long after he shot "Apocalypse Now," his Vietnam-set retelling of "Heart of Darkness," the director traveled to what had recently been known as British Honduras. He was searching for a primitive escape that recalled the tropical wilds of the Philippines, where "Apocalypse Now" was filmed. When he landed in Belize in 1981, he was really looking for a getaway where he could write. But he ended up becoming an innkeeper, and his swank, eco-friendly resorts — one on Belize's shoreline outside Placencia, the other tucked into the untamed forest about an hour from the country's western border with Guatemala — became the standard against which other Belizean high-end area properties are measured. Looking down on one of Caracol's pyramids. Coppola initially considered buying his own Philippine island to cure his "Apocalypse Now" longing. He soon stumbled upon a lodge inside Belize's Mountain Pine Ridge Forest Reserve, not far from the village of San Ignacio, where he typed by candlelight in silence because there was neither electricity nor phones. "The jungle is a wonderful place," he told me after we returned from Belize. "And I was looking to re-create the experience I had working on the film." 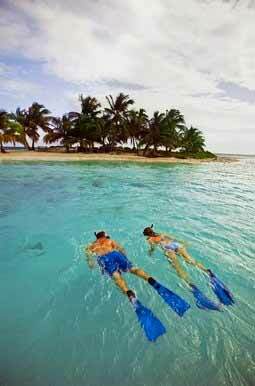 Laughing Bird Caye National Park offers visitors the chance to swim with rays and turtles. As Coppola spent more time with his family in the wild, he added modern conveniences to his getaway, then staff to keep up the place. He didn't intend to house paying guests, and he certainly never aimed to be an innkeeper. But little by little, his secluded retreat started to look a lot like a hotel. In 1993, his would-be writing escape was re-christened Blancaneaux Lodge, after the French botanist who originally owned the land. 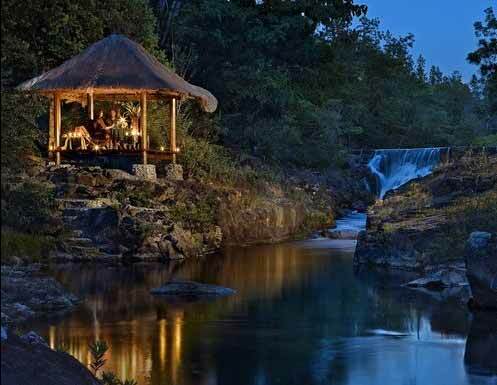 Twenty cabanas and villas now nestle along Privassion Creek, about an hour's teeth-rattling drive by four-wheel-drive vehicle from the nearest paved road. If Blancaneaux Lodge and Turtle Inn were Hollywood movies, you would recognize similar directorial touches throughout — spacious open-air accommodations, handcrafted furnishings, organic local produce, Coppola's wines, impeccable hospitality and a variety of pricey, guided excursions. But the two properties, which Coppola visits regularly, are ultimately as different as the director's "The Conversation" is from his "The Cotton Club." A beach in Laughing Bird Caye. There's no natural order to which property to visit first, but if you prefer self-directed days amid solitude at the start of your vacation and more locals and local culture at the end, start at Blancaneaux, which can be reached by a private airstrip (a short patch of dirt, to be accurate) or a three-hour drive from Belize City (which now can be reached on nonstop flights from Los Angeles. 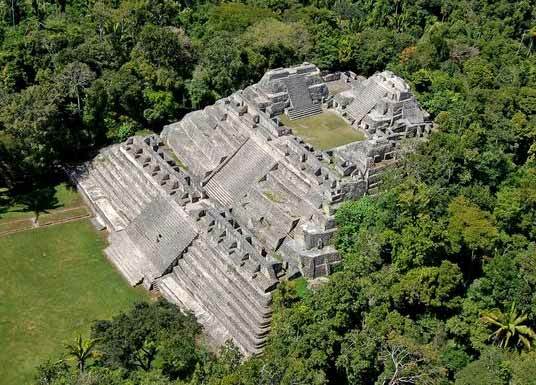 Although the infrastructure has improved dramatically since Coppola first arrived, the nation remains largely undeveloped and inaccessible, which explains how a construction crew recently was able to grind up a small, 2,300-year-old Maya ruin to make roads without being detected until it was too late. 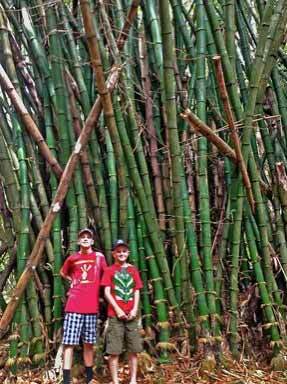 Bamboo growths tower over some young visitors. If you don't want to leave the property, Blancaneaux has just enough, but barely so, to keep you occupied for a few days. The nearest other resort, the Gaïa Riverlodge, is a 15-minute drive, and there's no town in the immediate vicinity, which is largely populated with Prussian Mennonite farms. Blancaneaux, which has worked with the Rainforest Alliance conservation organization to develop and maintain environmentally sustainable practices, has no air conditioners or televisions, and at night, without artificial illumination, the grounds are so dark you need a flashlight to navigate. Eager to see the area, we took ourselves on a one-hour hike to Big Rock Falls, swimming underneath a cascade and enjoying a picnic lunch ($50 for four) prepared and packed into two day packs by the lodge's staff. If, like us, you don't have a rental car, the more ambitious trips out of Blancaneaux aren't cheap. We took three excursions, a 12-hour journey to Guatemala's massive ruins of Tikal (about $1,000 for the family, which includes entrance fees, lunch, three separate guides and a private tour) and half-day trips canoeing about a mile up the pitch-black Barton Creek caves ($450) and zip lining through the local forest ($100). Other outings include a night hike in search of jaguars and a tour of the local Mayan ruins of Caracol. We thought the food at Blancaneaux was fine, but after several days of not eating anywhere else, we had a driver take us to Gaïa Riverlodge for dinner. It was perfectly lovely, but not as good as where we were staying. If Blancaneaux's origins were guided by happenstance, the history of Turtle Inn is a bit unluckier. After numerous Blancaneaux guests asked him to recommend a beach-side place to stay, Coppola decided to buy a rustic property on an exposed spit of land near the tip of a sandy peninsula outside Placencia. Just months after he acquired the resort, it was destroyed by Hurricane Iris in 2001. "There was nothing left — it was just an empty beach," Coppola said. "So I rebuilt it in a much more deluxe style." Unlike Blancaneaux, the Turtle Inn property, with 25 thatched-roof cottages and villas, promises more to do off property than on it. Although you can book scuba trips from the hotel, dive shops abound nearby, and we spent countless hours swimming, snorkeling in the clear blue water and taking the resort's small catamaran and sea kayaks out for a spin. Rather than pay Turtle Inn $80 a person for a half-day exploration of the mangrove islands along the Monkey River (where my sons and I ate live termites, a local delicacy), we paid $60 each to Splash Dive Center, saving us $80 total, for the same trip. 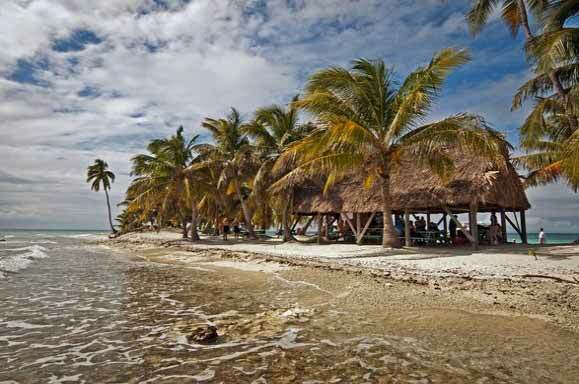 But when choppy seas forced another off-property tour operator to cancel our planned snorkeling trip to the spectacular national park Laughing Bird Caye, about an hour's boat ride, Turtle Inn booked its own more powerful boat and packed lunches for us. The cost was dear (about $600 for the whole day), but swimming with rays, turtles and thousands of fish was beyond price. The village of Placencia, several hundred yards south, is packed with tiny restaurants serving fish and conch just brought to market, and every night we either rode the inn's bicycles or took its shuttle bus (the mosquitoes were thick and hungry) into town. We had lovely meals at Rumfish y Vino and Secret Garden, where dinner was about $25 a person, followed by a $2 gelato from Tutti Frutti, the local ice cream parlor. At both Blancaneaux and Turtle Inn, the disparity between the local standard of living and the comforts enjoyed by tourists is startling and disquieting. But neither resort feels like a fortress, and their environmental footprints are minimal — banana peels brought back from packed lunches are composted, and all the water bottles are refillable glass. Coppola said the properties ultimately are a lot like movies. "The staff is the cast of the film, and the guests are the audience," he said. "And you invite your guests into a world, maybe a magical world. And as with a movie, there's always a detail — some little thing — that people remember. "Hotels are not really that far from my original training and love. It's just a different stage."